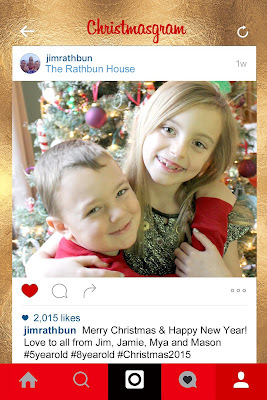 I wanted to share our Instagram-style Christmas card that I designed! If you still haven't decided on a card yet, these are available in my shop! Turnover is 24 hrs. if you order by 12/22/15!! On the card we actually sent out, we used our address where it says "The Rathbun House." It was a difficult decision whether to use my husband's Instagram name or mine, but as you can see, we decided on his! I hope you all are getting through the chaos of the season and enjoying your time of shopping, family, and food! Merry Christmas to all !